I decided to visit the Republic of San Marino out of curiosity: what would the world’s fifth smallest country be like? Just how small is it and is it as pretty as I’d seen in pictures? Entirely surrounded by Italy, does it have a real Italianate feel to it? 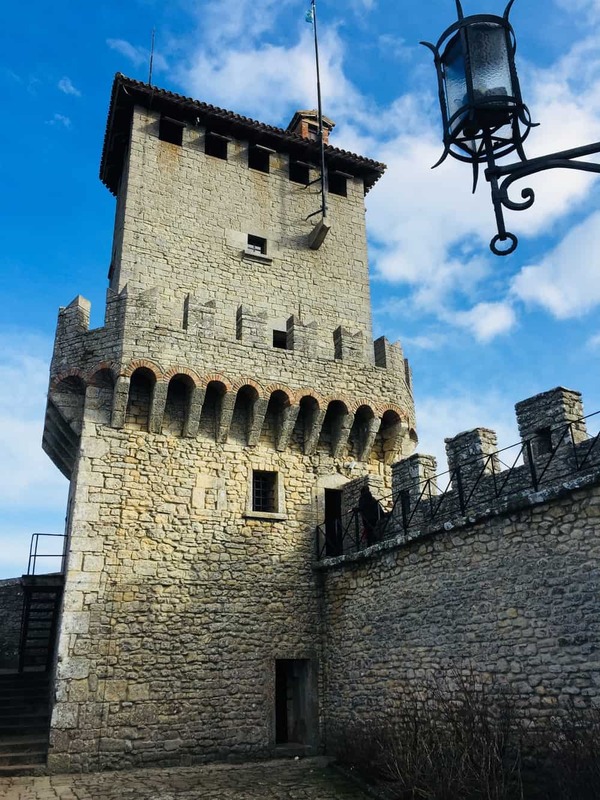 We started our trip with an overnight stay in Rimini (which was much nicer than I’d been led to believe) before taking the 45-minute bus ride up to San Marino. 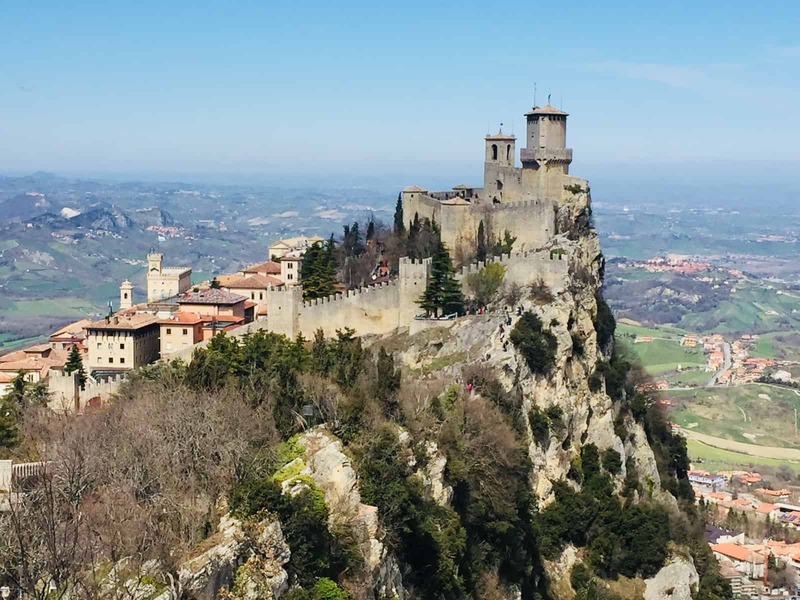 The bus takes you out in the Italian countryside and fairly quickly into San Marino. At first it’s relatively flat and non-descript as you pass by modern residential and business areas, and it looks nothing like the guidebook pictures – but this is because, as a tourist, you’re actually heading for the City of San Marino (or Citta) and may have, (certainly in my case), overlooked the fact that the country of San Marino is not just the historic city at its heart perched high up on a scraggy rock, but also encompasses a scattering of outlying smaller towns and villages. You therefore have to be patient and wait a while before what you’re expecting comes into view – and it’s then that you see the medieval mountain top citadel looming imposingly over the countryside and Mount Titano below. 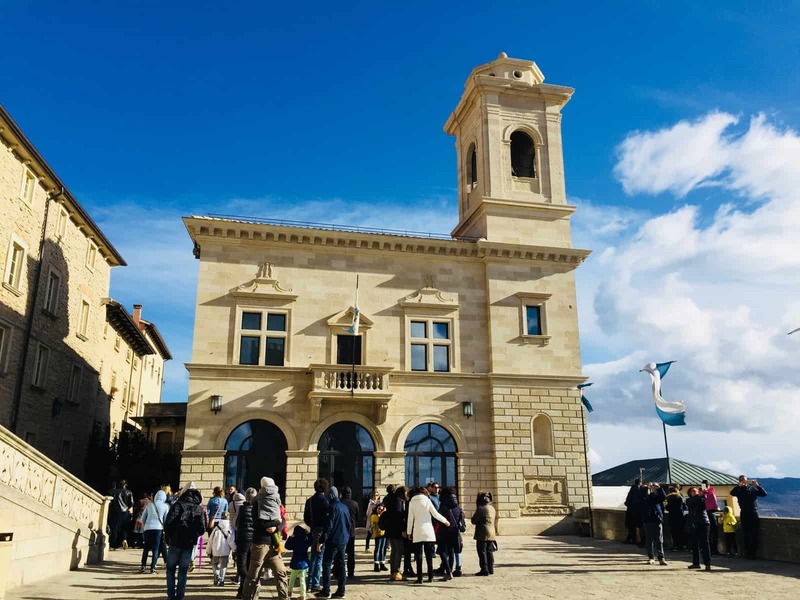 As you get nearer and nearer you realise just how amazing – and eye-catching – it is, so much so, that in 2008 it was designated a UNESCO World Heritage site. What strikes you immediately is how small the city is (the entire country is less than 24 square miles) and also how well preserved and pretty it is. 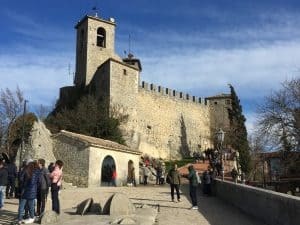 It’s possible to walk around the main sights in a matter of hours, including the three impressive ancient towers guarding the outer defence walls of the fortress, the cable car ride down to the lower village of Borgo Maggiore and the main square, Piazza della Liberta, with the city’s Public Palace. This is a lovely place to sit outside in a café soaking up the atmosphere and taking in your surroundings. We were there on Easter Sunday and were lucky enough to witness the formal parade that took place in celebration of the Most Excellent Captain’s Regent Investiture Ceremony: a fanfare of several different troupes sporting a myriad of colourful and ornate military uniforms, who, alongside what appeared to be the local dignitaries, made their way through the streets, starting from the Piazza. Witnessing this display of one of San Marino’s traditions was a particularly memorable part of the trip. 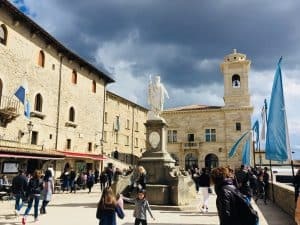 A wander through the small winding cobbled streets is a must, (beware though, there are some steep slopes and steps to negotiate in the city, so it may not be suitable for anyone with poor mobility), with its plethora of souvenir shops and it countless cafes and restaurants to sit in and have a bite to eat. 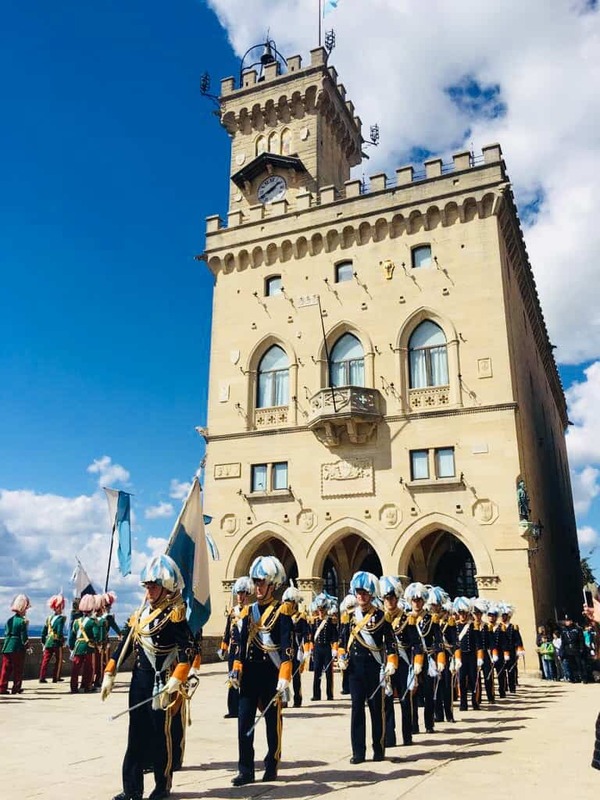 Much of the food is – unsurprisingly – Italian, although there are some more local Sammarinese dishes to try, including the Torta Tre Monti, a cake honouring the three towers in San Marino. It really is a lovely place to visit for a few hours. 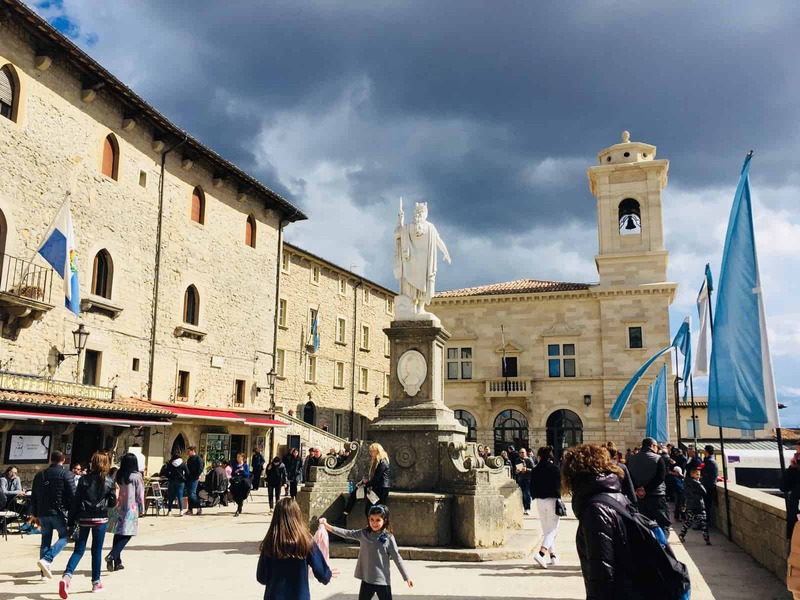 However, spend a bit longer here, (we stayed overnight), and you start to notice small things that seem to be in stark contrast to the splendour of San Marino’s main sights. Take, for example, the fact that once the day trippers had left for the day and the streets were less crowded, we realised that many of the streets in the historical centre included either a gun or sword shop – yes, not one gun shop or one sword shop, but several….it was quite unnerving to see shelves of Samurai swords and pistols. Initially, I naively thought that these were shops selling replicas (there is, after all a torture museum here…), but that wasn’t the case. 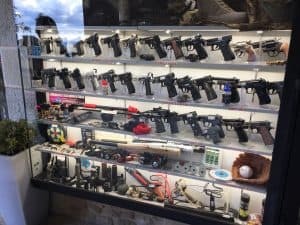 Apparently, San Marino has the most liberal gun laws in western Europe and so buying your weapon of choice here is not at all hard. Coming from the UK, it was a bit of a shock to see them so freely available and seemingly as easy to purchase as the local Italian gelato. 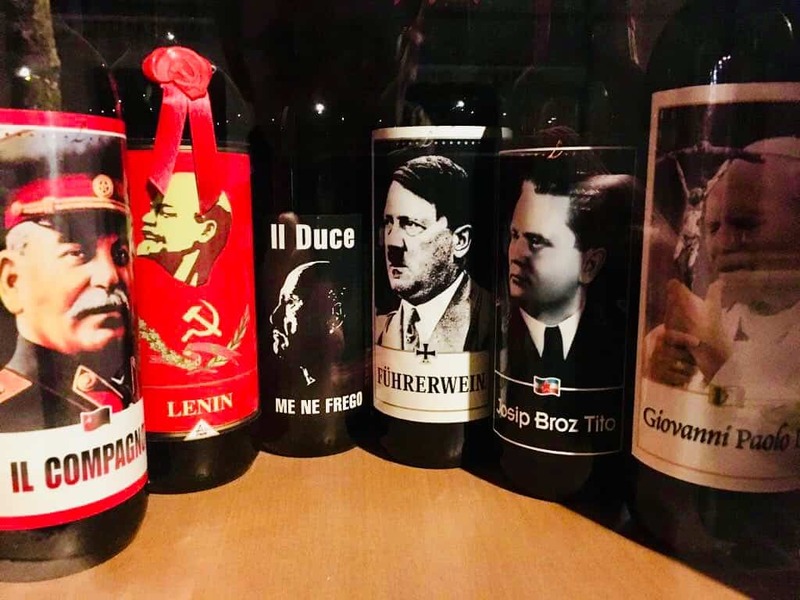 Not far from our hotel, we also stumbled across a shop where you could buy “dictator” beer and wine – so wine and beer with images of Hitler, Stalin, Tito etc splashed across them. Quite why you would want to buy one of these, or who would want one as a souvenir, is beyond me, but if you do want one, San Marino is the place. We also found the evenings, when the tourists had left, a little desolate. The streets clear out – not a bad thing at all – but it means that some of the buzzy atmosphere of the day peters out. Some of the bars also close up early. Maybe this was because we visited at a time that was still fairly early in the tourist season, or maybe this is usual for San Marino, it being a place where people often only come for the day. 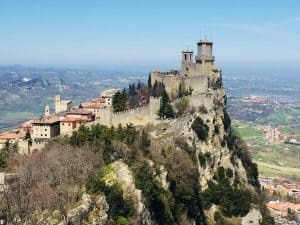 But this may contribute to the Lonely Planet guide’s statement that San Marino “retains a curious lack of intimacy and lacks soul”. So, for me, San Marino was a bit of an enigma: it really is very beautiful and not to be missed if you’re nearby in northern Italy. It’s definitely somewhere that I’d recommend visiting for a short while – maybe for the day or just one night. Whether or not you need to stay any longer is debateable. 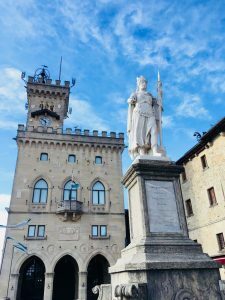 The bus from Rimini to San Marino goes from outside the main train station and drops you in the centre of San Marino. Entry to museums costs €4,50 (reduced price €3,50) or €6,50 for two museums and €10,50 for 5.